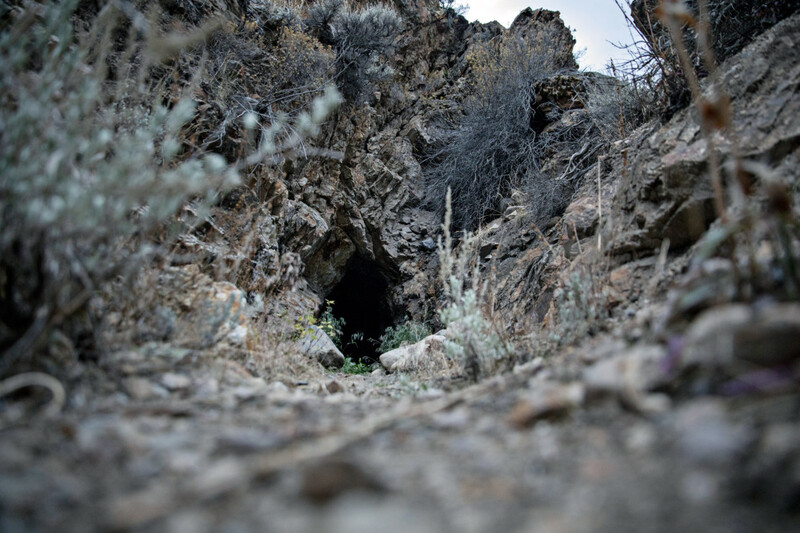 A crew of five wildlife biologists wearing overalls, helmets and headlamps walked up the flanks of a juniper-studded mountain and climbed through stout steel bars to enter an abandoned mine that serves as a bat hibernaculum. The swinging white light of the headlamps probed cracks and crevices in the walls of the long dark and narrow tunnel, as the team walked half a mile into the earth. When they spied a bat, they gently plucked the mouse-sized, chestnut brown mammal — Townsend’s long eared and Western small footed are the two most abundant species in Ely, Nevada — off the walls and deposited them in white cloth bags. A lone big brown bat was also gathered. At one point a bat, disturbed by the scientific ruckus, fluttered by, the headlamps illuminating its membranous, thin wings. During the survey in November, the bats were in their pre-hibernation phase, clinging to the grey rock wall with tiny grappling hook-like feet, gently breathing. They are in full hibernation mode now. Cute, interesting and facing a deeply uncertain future. 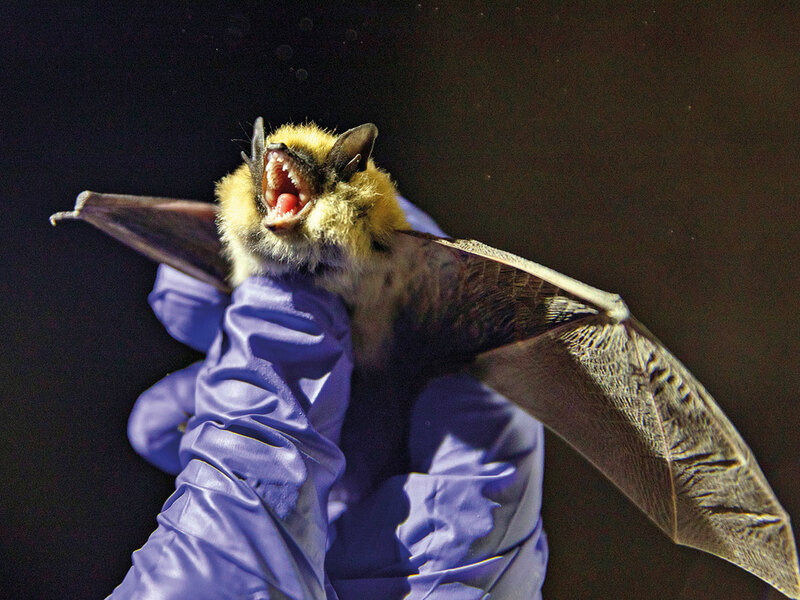 This foray is part of a continentwide effort, from Canada to Oklahoma, to plumb mines and caves in hopes of figuring out how a virulent and rapidly spreading invasive fungal bat disease called white-nose syndrome, which is bearing down on the West, will behave when it hits the native populations here. White-nose syndrome, caused by the fungus Pseudogymnoascus destructans (Pd), is named for the fuzzy spots that appear on bats’ noses and wings. Over the last decade state, federal and tribal agencies, along with nonprofit organisations, have been working around the country to try to get ahead of the disease and find a remedy to save the 47 species of bats in North America. So far the syndrome has defied the efforts. After nearly 30 animals were gathered from the mine walls, the researchers hiked back out of the tunnel, disrobed and put their clothes into plastic bags to launder, and washed their helmets and other equipment with alcohol to avoid inadvertently spreading the fungus, should it be present. Then they took the bags with their tiny quarry into a small, white windowless trailer stuffed with an animal MRI and a respirometer with a tangle of dozens of clear plastic tubes, to weigh and measure the bats in several different ways. “This research will inform us which bats will be susceptible and which will be resistant, which will inform a conservation and intervention strategy,” said Sarah H. Olson, associate director of wildlife health for the Wildlife Conservation Society. The disease was discovered in a cave in Schoharie County outside of Albany, New York, in 2006, most likely introduced inadvertently from Eurasia. Since then, the pathogen has spread to at least 36 states and seven provinces of Canada, killing whole colonies of bats. Researchers have described finding cave floors littered with bat carcasses, sometimes many thousands in a single cave. So far more than 6 million bats have died in Canada and the United States. Their loss could be consequential: Bats play a critical ecological role, pollinating plants in some places and controlling mosquitoes and other insects. Having ravaged much of the East Coast and infecting an isolated, outlier region near Seattle, white-nose syndrome is heading deep into the West at the rate of about a state per year, and has appeared on the eastern edge of the region, killing bats in South Dakota, Oklahoma and eastern Wyoming. That means in the next few years it could reach the thousands of caves and abandoned mines of the Rocky Mountains, the redoubts of overwintering bats. “Hibernating bats are most likely to be affected,” said Jonathan Reichard, assistant coordinator for the Fish and Wildlife Service’s programme on white-nose syndrome. Biologists have just begun searching caves in the West to see where new infections may have occurred during this winter. A great deal about white-nose syndrome is unknown, as is a good deal of the behaviour and attributes of bats. The arid west has a different bat ecology than the more humid regions of the East. Scientists believe the key to devising a strategy to combat the disease may involve a better understanding of the bats’ hibernation physiology. But as decimating as the disease is, there are experts who think efforts to treat or even research the disease is wrongheaded, a waste of money that could do more harm than good. The National Speleological Society, a group of cave explorers who also study and work for the conservation of caves, opposes these kinds of efforts, especially the blanket closing of caves to the public to keep the disease from spreading. We “deplore current actions,” they wrote in a letter to then Interior Secretary Ryan Zinke, last year. Merlin Tuttle, a bat expert in Texas, also thinks these multiagency efforts to stem the disease are foolhardy and may harm the bats. “Disrupting them during hibernation is adding stress at a time they can least afford it,” he said. When they fall into their big sleep, from November to April, bats are in torpor, a state where they dial down their physiology — heart rate, respiration and the like — for three weeks at a time. A waking heart rate of 750 beats per minute drops to 150 during torpor. Then, for two days, they rouse themselves to drink water, mate and take care of other business before they sink into slumber again. Instead of rousing every three weeks, though, infected bats wake every seven days, because white-nose illness causes dehydration and they need to drink. While the roused period is small, it is physiologically expensive. Expending more energy depletes the fat they store to make it through hibernation, and they become emaciated during dormancy. They can die in the cave, or starving, leave the cave early to search for food only to find the world snow-covered, locked in a winter they can’t survive. That’s why this team has spent so much time and money on high-end, highly-sensitive equipment to fathom the secrets of bat hibernation. “We can get respirometry from a single fruit fly,” said Fuller proudly as he stood before the stack of equipment that makes up the respirometer. In addition, the little mammals are placed in a long, clear plexiglass tube and slid into an MRI machine. In just a few minutes their muscle mass, fat and water levels are measured. Once the baseline data are established, “in areas like this where it’s not yet arrived, we can form a predictive model based on ecology, physiology, genetics and skin chemistry,” Reichard said. 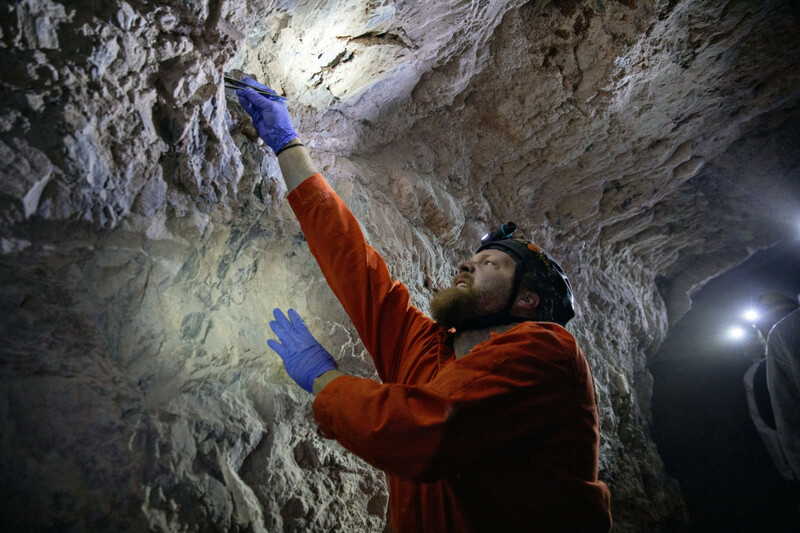 Biologists have considered putting food in caves, or feeding bats probiotics or electrolytes or applying chemical skin treatments to kill the fungus. They have talked about dehumidifiers. In some places they have fogged the caves with antifungal agents such as B-23, which is made from the stems of wild pineapples. Exposing infected bats to ultra violet light shows promise and is being tested. “UV light can kill the fungus in the lab but we don’t have a feasible deployment scheme,” Reichard said. Tuttle cautions that such experiments could go awry. “Using something to kill the fungus is going to kill other fungi or microorganisms in the cave that will cause other chain reactions and problems that are far greater than what we started with,” he said. Treated bats may also get reinfected. While researchers are focused on the here and now, a warming world is expected to play a role in the future of bats, and perhaps this disease, though it’s too early to say how.